There are Flatbed Trucks and Flat Screen TVs and Flatbread. At Halstead, we’re joining right in with the Flat Fun. 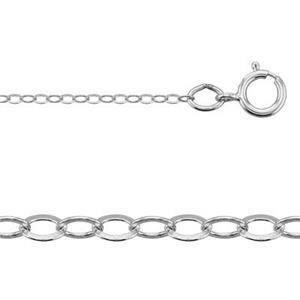 Our 21316F30 – Bright, Eye-Catching, Sterling Silver 30-Inch Finished 1.4mm Flat Cable Chain with Spring Ring. 30 Inches – the Opera Length. We also carry these in finished lengths of 16-Inches – 18-Inches - 20-Inches – and 24-Inches. So choose your length! Flat is here to stay! Confused about all the different styles of chain? Please take a moment to read our Jewelry Chain Glossary of Styles.